OBLSK was delighted to present the Mannequin Mapping project at the Retail Summit Convention in Columbus, Ohio. The Retail Summit is an awesome convention that brings together brilliant retailers, entrepreneurs, designers, and innovators. Plus it creates a space to talk about the economics of our city and how we can create an abundant city that is thoughtful and progressive in its initiatives. The Mannequin Mapping project is designed for merchants to showcase their designs and products utilizing projection through a controllable app. HUGE Thanks to ZenGenius for supporting the dream and lending the mannequins, and for the Retail Summit for giving us the opportunity to present. Independent's Day is an awesome festival made up of Artists, Musicians, and Local Business. It is truly one of my favorite festivals with its raw integrity and gritty perseverance as well as its brilliant display of the Arts, Music, and local Community. OBLSK presented the Raincloud a massive interactive glowing Cloud Balloon that incorporated Performance, Sound, Interactivity, Dance, Light, and Community. The H2OHIO water panel was a great success as we discussed the state of Ohio's Fresh water on a global scale with water experts. In the evening, Pilgrim Heidi with OpenHeartCreatures performed Empathy Eyeball while the RainCloud stormed. Participating OBLSK Artists were Pelham Johnston, Maxwell McEvoy, Marque Reavely, Stacie Sells-Vanscoder, and eve Warnock. OBLSK was commissioned by the Short North Alliance to create Entangled an immersive projection Installation for HighBall Halloween 2017. This incredible installation mesmerized and fascinated the party goers. We were/are super excited about the concepts and the creative interlacing of media, architectural design, interactivity, and performance. Entangled would not have been possible without the support from Friends and Family. Special thanks goes out to Sarah Iles Johnston, Eric Warnock, Ben Warnock, and Kaleb Warnock for their support. Windchimes Chinese Restaurant: Website Design, Social Media Madness, and Lenny, the Ninja Rooster. Windchimes Chinese in an incredible Chinese restaurant in the Dublin, Area and one of our first clients. Check out this savvy website that we designed for them. OBLSK is responsible for the cool media, the enticing photos, and the awesome blog content. If your are interested in food health facts, enchanting travel excursions, and awesome recipes you should definitely follow Windchimes Blog. Be sure not to miss Lenny the rooster. Have you met him? OBLSK loves to create unique marketing ideas that bring humor and satire to make you laugh. Check out this new video that we made for the Windchimes Chinese Restaurant. We LOVE Windchimes! If you have not eaten there, Its a must. The new curry dishes are Delish! Wakka Wakka production is one of the most innovative, progressive puppet theater companies around. They are true storytellers and their craft in puppet making and maneuvering is unbelievable. They create everything from the content, to the music, to the choreograph, to the stage set and design. If you get a chance to see a Wakka Wakka productions...DO IT! It is a lifetime experience to witness such expertise and craft in the world of puppets. Hmmm lets see what did the New York times say "these people may be geniuses..." and that's just the beginning. OBLSK was honored to create a teaser for their Made in China production Norway tour 2018. Take a look, and decide for yourself! 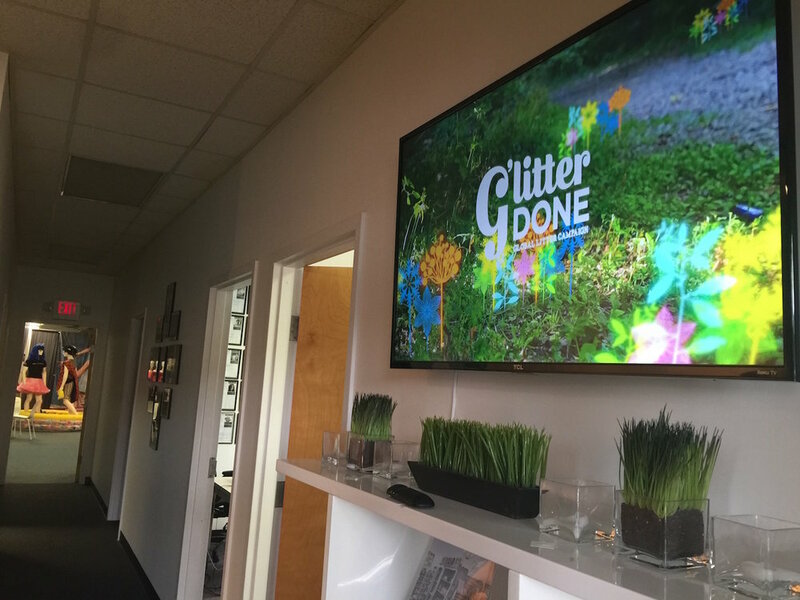 We had a pleasant surprise when we walked into the ZenGenius headquarters and saw the GlitterDone Video that OBLSK produced up on the Big Screen in the Lobby. Look at how vibrant it it is! and the beautiful shot design by Pelham Johnston is calming and soothing. The GlitterDone Campaign promotes keeping our earth clean from litter and trash. Simple actions by individuals, like picking up litter, have huge impacts if we all work together. Take a gander at the news feed that we have created for JMKW Development Construction Company an Industrial Developer based out of El Paso Construction. OBLSK collaborated in designing the Web Site and generates the Marketing Strategies. We handle the Social Media Management and produce the Media Content. We would love thoughts and Feedback on what areas are super interesting, and what areas are so so. Plus if you have any ideas in possible directions or applications... we are all ears! 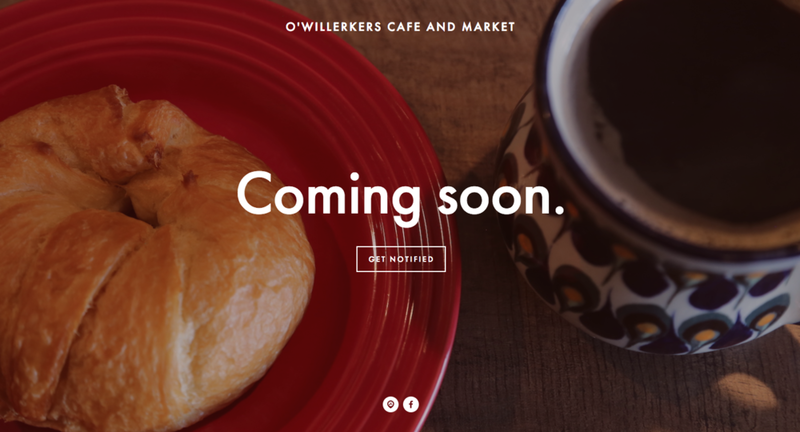 Keep your Eyes open for our newest client O'Willerkers Cafe in Logan, Ohio that serves homemade Ohio meals and pastries. It's a wonderful gathering place for the Ohio local or the traveler exploring the beautiful southern Ohio landscape. OBLSK is designing the Logo, and web site, as well as producing the media to give this cafe a powerful yet humble online presence. 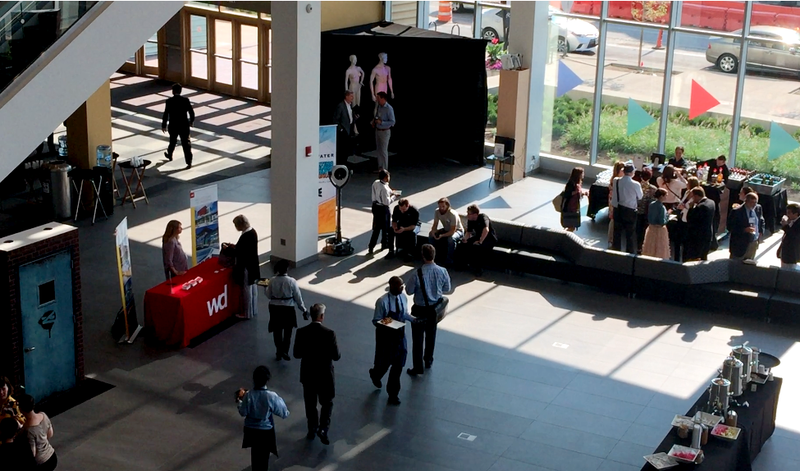 RainCloud was presented at the IDX fest this last weekend Sept. 16th and 17th. and was a huge success! RainCloud is a floating augmented high-tech installation as well as a symbol of the natural environment; a reminder of the simple beauty found in our atmosphere and the never-ending cycle of water between ground and sky. This simulated cloud floats 18 feet from the ground in an outdoor environment, and is illuminated from within using RGB LED lights. During the day, it shimmers due to the reflective, iridescent qualities of its outer skin while at night it glows equally as brilliant by using artificial light. Glowing from within, the RainCloud changes color based on interaction from the audience (attendees of the arts festival) and/or based on environmental changes in its surroundings in real time. The RainCloud acts as a stage for performance, music, and education. Pilgrim Heidi Kambitsch of OpenHeartCreatures performed Empathy Eyeball which was a beautiful puppet movement piece that revealed the frenzy of humanity through clashing thunderbolts. The performance ended with the empathy eyeball releasing tears of joy and sadness. RainCloud would not have been possible without the determination, talents, and perserverence of the OBLSK team of Artists. Pelham Johnston: Director- Pelham led the RainCloud project overseeing the design choices, the integration of electronic components, and the interactive elements. Pelham was quite impressive with 10 hrs of sleep in the last 4 days before the installation. Maxwell McEvoy: Production Artist-Maxwell was on the project from concept to completion offering support in the structural design, concept, and aesthetic of the RainCloud. Maxwell was the master seamster, without his dedication to heat sealing the seams the RainCloud would never float. Marque Reavley: Software Engineer- Marque is a software wizard and a virtuoso in working through glitches and possible hiccups in the code. He is an incredible collaborator and his calm energy and efficient work ethic keeps us all in awe. Aidan Seine: Electronics Engineer- Aidan was flown in from Los Angelos because of his incredible skills in electronic engineering. He was able to create magic working in large scale and under a tight budget. Stacie Sells-Vanscoder: Project Manager- Without Stacie this project would never have gotten off the ground pun intended!). Her organization and collaboration with all the outside parts and pieces made this piece real to the public . She was the drive behind the H2OHIO Freshwater panel discussion. eve Warnock: Creative Director/Producer- eve Warnock took the vision of the RainCloud and made it a reality. She has a knack for taking things out of the thin air and blowing them up to 30 ft to float. She has a passion for public art and pushes the boundaries for both the public and her team on concept, achievability, and imagination. Special Thank yous to Adam Brouillette and the IDX team that supported us on our visions and helped to make it possible, to American Polyfilm for donating the Polyurethane, To Sunny Meadow Flower Farm for donating the Grass, to Geers Gas for the discounted helium, To Sarah Iles Johnston for her support and sponsorship, and to our three beautiful children, Wolfgang, Archer, and Orion for their patience, love, and inspiration.